Without professional termite treatment, homes and businesses could suffer thousands of dollars of interior and exterior damage. 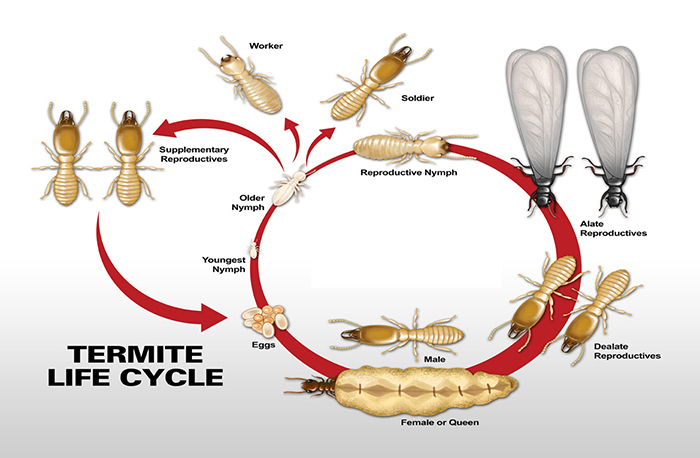 Termite control is achieved by knowledgeable and well-trained exterminators who evaluate the entire building and property to determine the proper application needed. Subterranean varieties live in loose and wet dirt, trees that have fallen and stumps. Warmer seasons find winged termites swarming to locate a new nest for part of their colony as it grows too large. Drywood termites inhabit wood structures including furniture. Dampwood species prefer wood below or at ground level and often infest shrubs, trees, grapevines, fences, posts and poles. Serious damage may have already been inflicted by the time a homeowner or business owner discovers termite infestation. A barrier of pesticide will be placed in the ground to keep these pests out, and traps with tainted bait are positioned for unsuspecting termites to take back to the colony. We are a Brownwood Texas based exterminator, and are confident our highly trained technicians can come out and take care of your termite problem. Give us a call today for a free quote. Get a free termite control quote from Crysler’s today!